I enjoyed undertaking this interview on the 2BReal magazine platform recently. 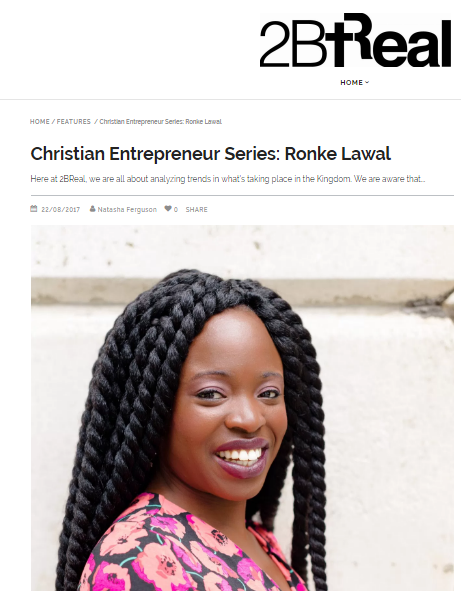 I shared my business story and the importance of faith to my journey and growth. 2BReal: How has your journey as an entrepreneur developed you as a person? RL: When I was younger I wanted to be a millionaire, I still do but being an entrepreneur has really taught me so much more to life than the accumulation of riches. It has taught me about the true face of humanity. It has taught me that whilst I may celebrate others, others may not celebrate me and that I must learn to accept that. Entrepreneurship has taught me to see life as it should be seen by all, as an opportunity to give, to learn, to grow and to be a blessing through one’s talents. I am more concerned with truly living my purpose, using my gifts and being guided by my calling. I may not be rich financially but I am beyond blessed spiritually and the money is here. If it is part of my destiny to be a millionaire like Young Ronke wanted to be then I shall surely become one, if not then I know I shall never lack anything. I now have the confidence to say that I am blessed beyond measure.